Nils Grosch (Paris Lodron University Salzburg) and Wolfgang Gratzer (University Mozarteum Salzburg) launched the inter-university research initiative "Music and Migration" in 2016. For this project, "migration" is defined as an umbrella term for different acts of migration (e.g. migrant laborers, migration for educational purposes, or refugee movement). Such instances can be observed increasingly since the Middle Ages and are deeply intertwined with the history or music as well as current musical cultures. Thus, musicology can contribute significantly to the interdisciplinary field of migration research. This book series discusses the challenges associated with the relevant methodological decisions involved. This volume discusses theoretical and methodological considerations and contains suggestions of case studies in musicological migration research. Buy Here: Gratzer, Wolfgang and Nils Grosch (ed.). Musik und Migration. Musik und Migration Band 1. Münster: Waxmann, 2018. Convinced he could contribute to the rehabilitation of German culture, theatre artist P. Walter Jacob took over the management of the Städtischen Bühne Dortmund in 1950 - after seventeen years years of exile. Regime and war had changed German society and along its theatre landscape so fundamentally, that he had to revise many of his visions in the face of practical work and various conflicts. This study encompasses a wide range of selected topics, detailing the remigration preparation, the circumstances and conflicts surrounding his selection as theatre manger, the questions regarding his theatrical concept as well as restitution efforts in general. As a result, this book also paints a picture of postwar society in West-Germany, the working conditions in a war-torn city, as well as the theatre operation and its ties to the municipality and media. Moreover, the ongoing virulent anti-semitism as well as the mechanisms of concealment regarding the recent past become evident. 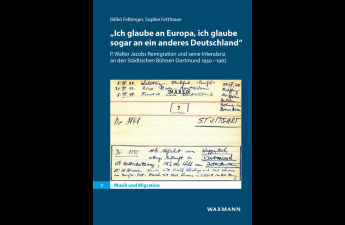 Buy here: Felbinger, Idilkó and Sophie Fetthauer (ed.). „Ich glaube an Europa, ich glaube sogar an ein anderes Deutschland.“ P. Walter Jacobs Remigration und seine Intendanz an den Städtischen Bühnen Dortmund 1950–1962. Musik und Migration Band 2. Münster: Waxmann, 2018.